Jackrabbits are really fast. As they run, their back legs come in front of their front legs. And did you know that a baby Jack is called a leveret. Having painted a number of Jacks in preparation for the seminar, I got tired of brown so this Jack is running away to hide - embarassed to be seen in purple. 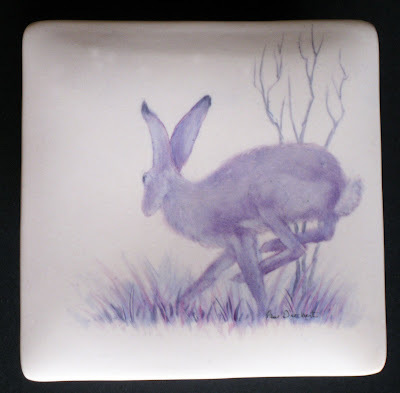 The purple Jack is painted on the lid of a bisque pink box. This is a hand made box. The porcelain was tinted pink before the box was formed and it has no glaze on it so it appears very soft instead of shiny like patent leather.